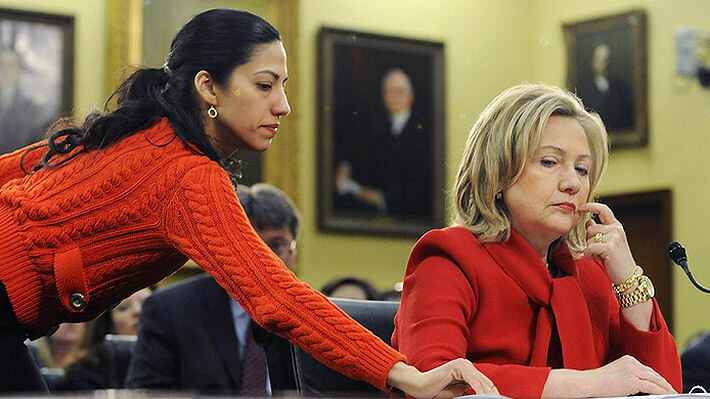 Huma Abedin with Hillary Clinton in state dept office. Abedin may be forced to testify against Clinton. We’re speculating that IF the FBI found incriminating emails between Huma Abedin and Hillary Clinton, Abedin may be forced to testify against her long time confidant. Kim Dotcom has been tweeting where ALL of Hillary’s Emails are located within the NSA’s Utah spy cloud. Meanwhile as conspiracy theories spin around in CyberSpace, Longtime Clinton supporter Doug Schoen withdraws his support, says if she is elected there will be a constitutional crisis. We shouldn’t elect a president that will be impeached. It has also been suggested that this reopened investigation into Hillary Clinton may be a smoke screen, covering up something huge that will crush Barack Obama. So here we GO.. The next few days should get really interesting. One thing is for certain, there is too much Corruption in Washington that needs to be stopped. Donald J. Trump Pledges to End the Corruption in Washington. Cyberspace is sure slow today. Everyone must be waiting on wikileaks email dump of the day.